Honestly, it took me a while to baby proof. I didn't think too much of it until Rosebud was crawling around getting into things. I started by simply shutting doors to rooms I didn't want her exploring or putting her in the exersaucer when I couldn't keep a close eye on her. I of course had the essentials like a gate for the stairs and outlet covers. When she started reaching the doorknobs and opening drawers, I knew I was in trouble. I went on a mission to find safety products that were functional, easy to install and fit well into our home. Let's talk about gates because they are extremely important. They are especially important if you have stairs. First, I bought one of those cheep gates from Walmart and discovered that it didn't even fit properly in my doorways. It also seemed like she could knock it right over. 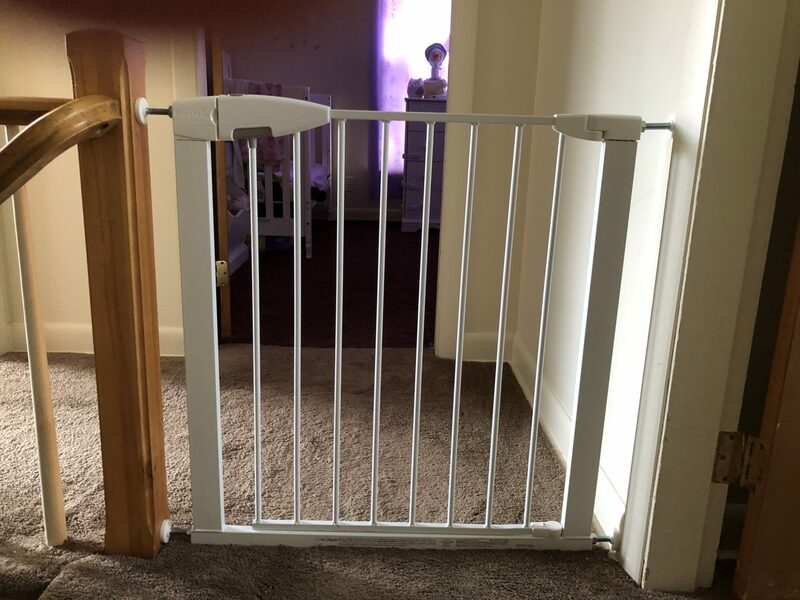 Next, I ordered a gate from amazon. This gate was sturdy and did the job, but the latch system was difficult to unlock with one hand. Back then, I had to carry Rosebud so using two hands was near impossible. I'd have to put her down, go back and latch the gate. The gate's opening was in the middle instead of the side, so the door stuck out if you left the gate open. I hated it so I went back to Amazon and the third time was a charm. I found this great gate from Munchkin and now have two of them. One is at the bottom of my stairs and the other is in my hallway, separating her bedroom from the stairs and the other rooms. This gate locks securely, the latch is a simple push button and the gate opens wide so there is plenty of room. My particular model does not automatically close when you walk through it, but they have a more expensive model that does. I highly recommend this line of gates. Are there entire rooms that you want to keep off limits? 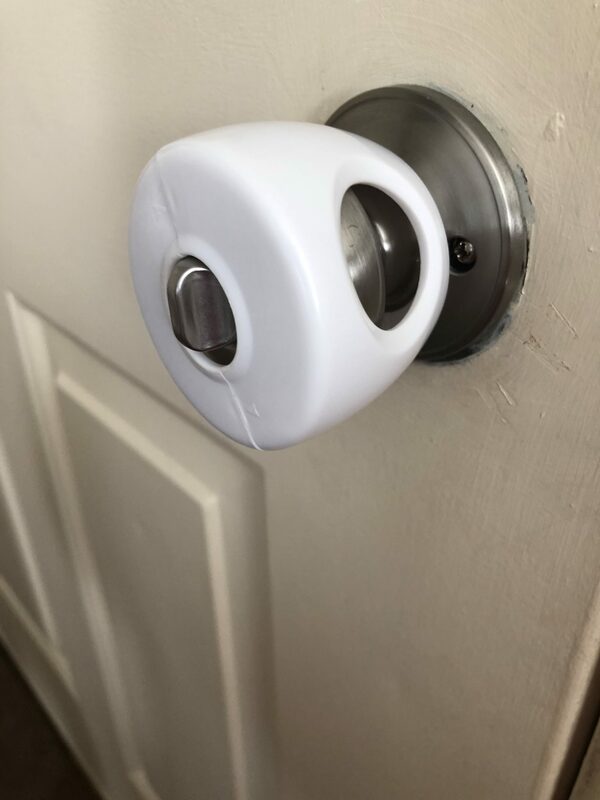 If they are rooms that you can keep closed, a child proof cover on the doorknob will do the trick. I found this four pack on Amazon and they work great. Each cover comes in two pieces that you just snap together over the doorknob. I keep one on the door leading outside, the bathroom, the laundry room and I keep one on my bedroom door. Rosebud's bedroom is next to mine and I don't put the gate between them because if she wakes up at night, I want her to be able to come find me. The way I have it set up, she can't go anywhere at night except for her bedroom or mine. This works fine when I'm right there, but when I'm not, Rosebud likes to go through my drawers and hide in my hamper. Now, if she wakes up while I'm in the shower or downstairs, I can shut my door and not have to worry about her safety. Even though Rosebud is two and a half, I still use her baby monitor. My cousin got it for me when I was pregnant. It has always worked great. I like how I can simply push a button, talk into it and let her know that I'll be right there. Now days, I'm pushing that button and telling her to go to sleep, but it's still very useful. Another feature is that the light level on the monitor changes when it detects sound. If the baby cries, the lights will start flashing. This way, you have an idea what is going on in your baby's room by both, sight and sound. 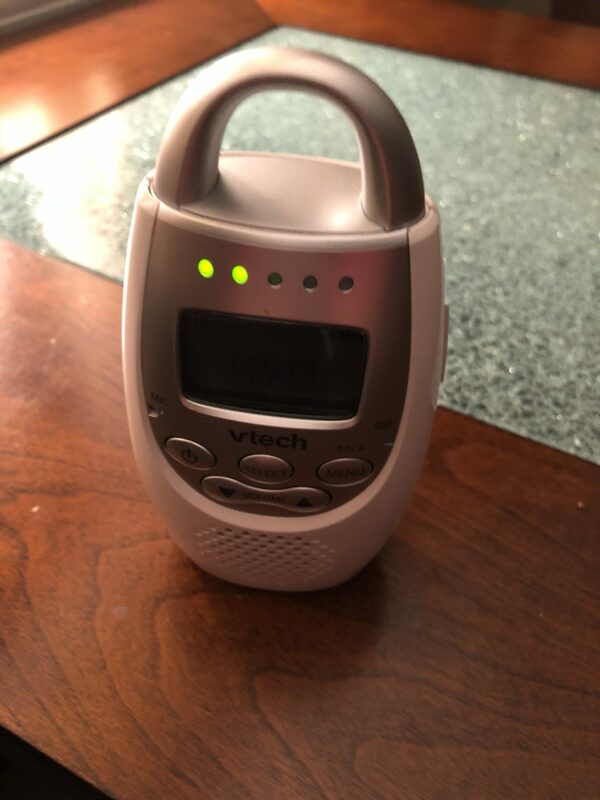 While looking up this product, I discovered that it has a vibrating alert option. It also has a night light on the little loop at the top on the baby unit. 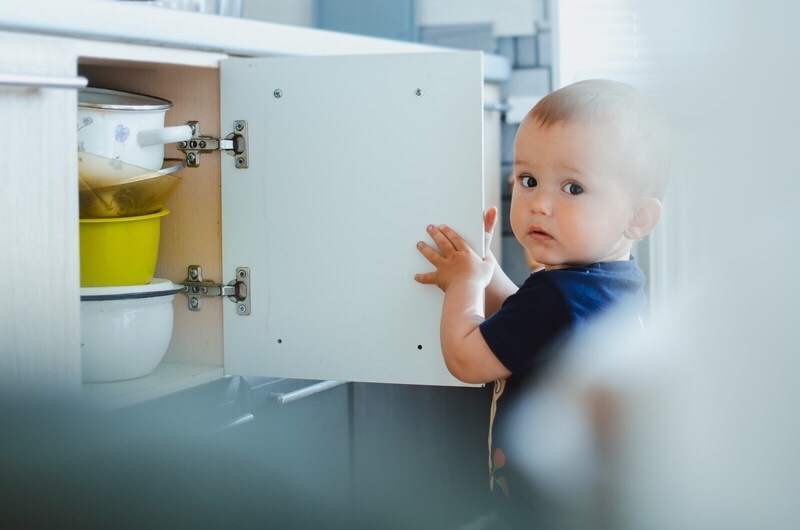 If you don't want pots and pans all over the floor or to discover that the groceries you bought yesterday have suddenly disappeared from the fridge, you'll need locks. I use two different kinds. The ones I use for the fridge and dressers have an adhesive back and they are flat pieces that slide into place. The set that I've found works really well. I've had them for almost a year now and have not had any trouble with the adhesive or Rosebud getting into the fridge. In fact, if I forget to lock it, she locks it for me. She can't unlock it though which is the important thing. 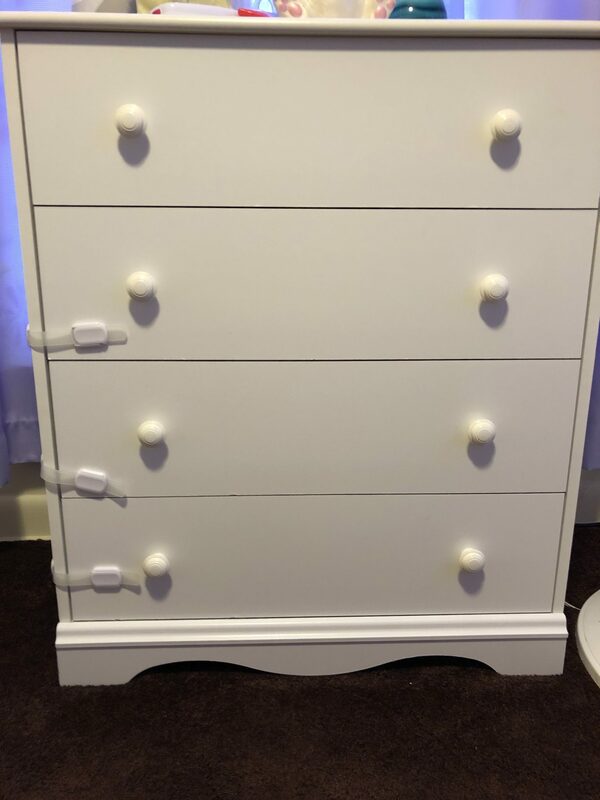 I keep locks on her dresser drawers because she likes to completely empty her dresser, unfold the clothes and scatter them all around the room. For the cupboards and bathroom sinks, I use a rope style lock. It goes around the handles and then you pull the strings tight so that the doors cannot be opened. This is so simple that you wouldn't think it would work, but it does. Rosebud has never been able to get into these cupboards as long as the ropes were securely tightened. A bonus if you have white cupboards, these would blend right in. The final safety item I will share is for fun outside the home. If you have anything bigger than one of those tiny plastic kiddy pools, then you might find this useful. This is an inflatable seat that a baby can sit in while floating around the pool. The legs simply go through the holes and the rest looks like an inner tube. Rosebud had two different styles, one with a sun roof and one with out. The one without had larger holes for the legs so she fit in it better, but the one with the sun roof obviously protected her from the sun. Rosebud loved her time in the pool. She was able to float in the pool at my mom's house because it was deeper, but in her pool here at home, she was able to walk around the pool using the float to push herself around. 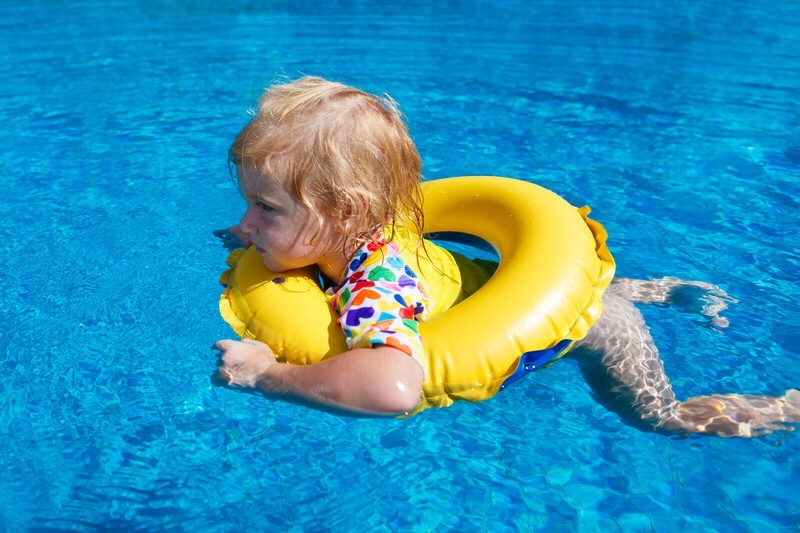 Of course, children should always have close supervision in the pool, but I found that this was a way to ensure safety while giving a tiny bit of freedom to explore the water. Now that Rosebud is bigger, she has been wearing a life jacket. I found this especially useful last year when she wasn't as steady on her feet. Now, she is able to go in her pool without one as she feels more comfortable in the water. When she goes in anything bigger than her little pool, she wears the life jacket. I know there are different schools of thought on this, but I think it's important that she knows when a life jacket is necessary and when she can go in the water without one. There are so many things to consider when it comes to safety. Some things you never even think about until you become a parent. Plus, the amount of products out there is almost endless. I was lucky enough to have experience in childcare so I was familiar with some of the safety products, but it's easy to get overwhelmed. what safety items are must haves for you? Let me know in the comments. Good tips. Thank you. As a special needs mom I am always looking for ways to keep my son safe. Keeping your children safe it so essential. The reason I liked your article especially, was because it really taught me something meaningful. I love the name Rosebud! So cute. 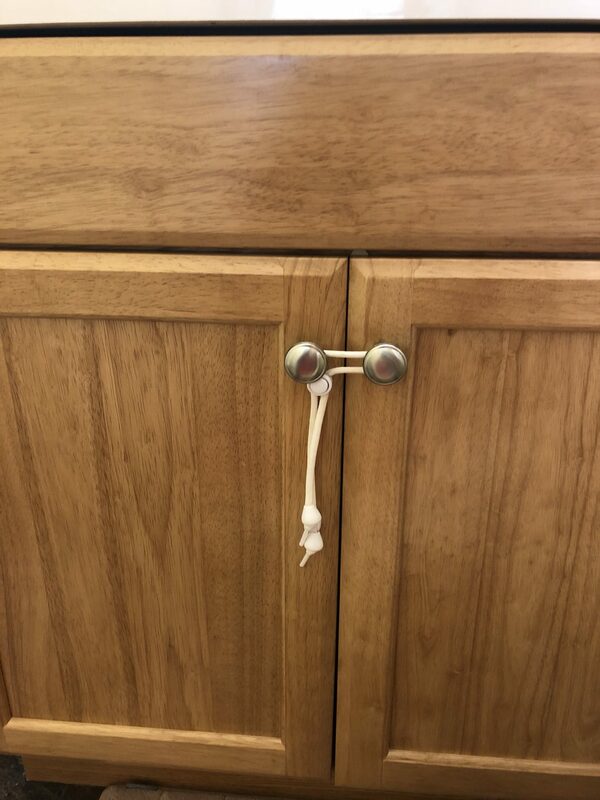 I never understood the fascination with slinging everything out of a cabinet or a drawer but those little mechanisms look like the perfect solution for this. Great timing, thank you. Yes. They have worked well so far. Thanks for the compliment. Rose is her middle name and she’s little, so that’s where Rosebud came from. Thanks for commenting.